So, we finished out the Grand Rapids RV Show last weekend. They got three inches of snow while we were there, and the temp was zero on Sunday with a -10 wind chill. Fortunately, we didn't have to go outside until our trip to the airport on Monday. Crowds were down a bit, but we had a good time doing the TV spots and seminars. It's always fun meeting folks at the shows. They have invited us back for next year, so we'll have to figure out what we're doing next winter before we can give them an answer. We got back to Arizona late last Monday night, and our overnight temperatures dipped into the 20s, with a low of 26 one night. Sheesh. We're still getting morning temperatures in the low 30s, but at least the days are warming up into the 60s and 70s for this weekend. Still, I had hoped for greater warmth in southern Arizona for this winter. Since we've been back here at Butterfield RV Resort, Linda has been crazy busy by choice. She has been walking in the morning, and we've been playing pickleball anytime anyone wants to get up a game. Plus she has been participating in several social events, she prepared a meal for the Chinese potluck we had, and she has taken on the task of teaching others Mahjong a few nights a week. 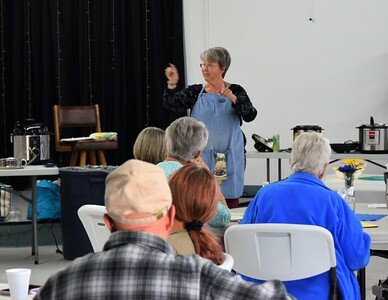 And, to put more on her plate, she volunteered to coordinate and present an Instant Pot demonstration yesterday (Friday). 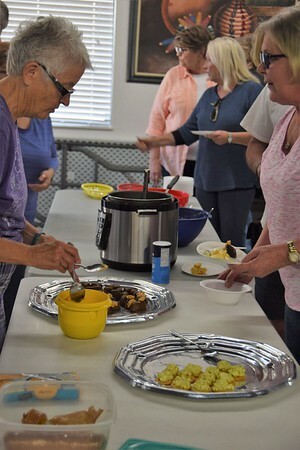 She had 42 people, 8 - 10 instant pots (and variations), and a few volunteers. 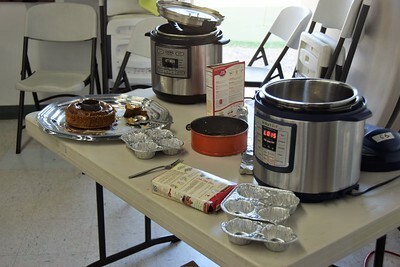 They demonstrated several dishes and provided samples of dips, cakes, brownies, spaghetti & meat sauce, egg salad, and more. 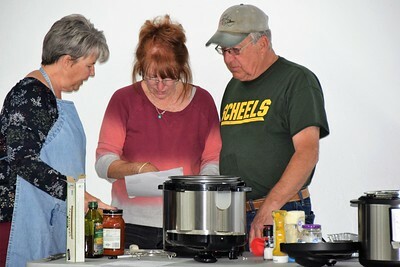 There were some experienced helpers and a few that had never taken their cookers out of the box until today. Standing in the back, I heard comments from lots of people saying they learned something new. It seemed to be quite a success. One day this week, we disconnected the RV, and took it out for a drive to get it a little exercise. 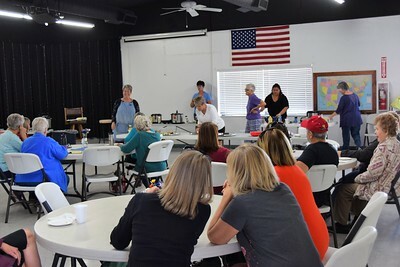 In our seminars, we highly recommend that seasonal RVers and snowbirds exercise their RVs at least once a month. A tiny percentage of people actually do it, but we thought we should practice what we preach. 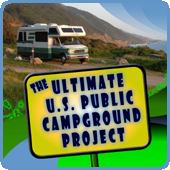 Exercising the motor and all the engine and drive train parts is good for motorhomes, and it's never a bad idea to put slides in and out and move any type of RV to heat up the rubber in the tires and keep the tires from getting flat spots. RVs actually work better when they are used consistently, and there will be less chance of having problems when it is finally time to move it at the end of a season if you make the effort and take the time to take it out for a brief spin from time to time. While Linda has been busy, I had the Jeep serviced and we put on new tires for our summer trip to Alaska. Other than time out for pickleball, I've been obsessing about our Alaska trip and planning an itinerary. I'll post a separate entry on our thought process to this point. Looks like fun keeping busy. Looking forward to your 2018 financial post. It helps me plan my future goals. 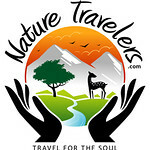 We have some interest in your plans for your summer trip to Alaska. Can’t wait to see your travel schedule/ timeline.